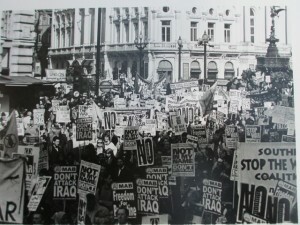 On February 15th 2003 – ten years ago last Friday – a million and a half people marched through the streets of London in protest against the invasion of Iraq. I was, and remain, proud to have been one of them. 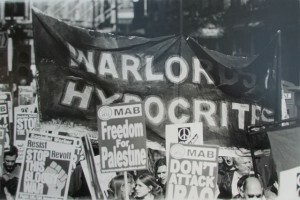 I marched with a woman who had also been present at the anti-Vietnam war protest in Grosvenor Square, and I met people from all walks of life, many of whom had never demonstrated before but who knew that the Blair government had no legal or moral right to lead the country into an unjust war. 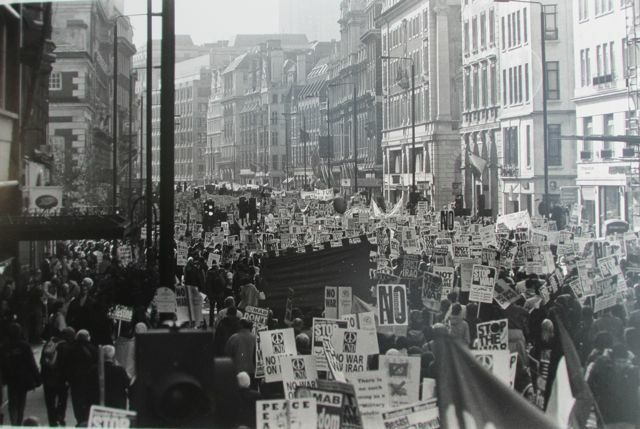 The numbers of people were so great that for long periods it ground to a halt, and by the time we reached Hyde Park many people were still waiting at the start. Ten years on it is all too clear that we were right to oppose the war. Just yesterday a series of car bombs ripped through the Shia areas of Baghdad adding yet more innocent lives to the horrendous death toll that has followed the invasion. Last month the bloody attack on an Algerian oil works underlined just how ineffective the war was in making the world a safer place. And those weapons of mass destruction? Well, they turned out to be a figment of Blair’s imagination, as most of us knew at the time. 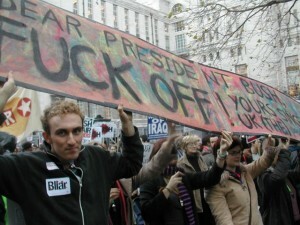 At the time Blair said that history would prove him right. It seems to have proved right those who claimed he was misleading the country. A new opinion poll shows that a large majority of the population now believe the war was wrong, with twice as many (55%) agreeing that “the London marchers were right”, because “a war sold on a false prospectus delivered little but bloodshed”, than the 28% who now believe the marchers were wrong. ‘Blair is judged to have been on the wrong side of history, right across the political spectrum,’ says a report on the findings. 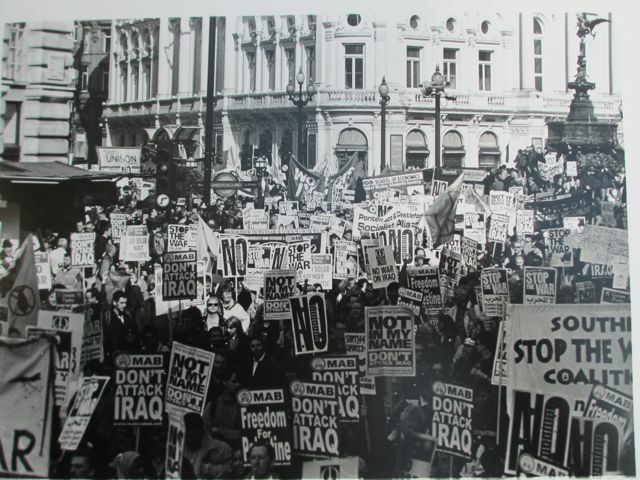 Even the Labour shadow cabinet in now bending over backwards to distance itself from the war – how appalling that at the time so few were prepared to take a stand. Here’s a demo of a song I wrote after one too many people had told me that it was a futile gesture. I have no plans to release the song properly, but here it is as a tribute to all the people who stood in the cold that day. And thanks also to Dominic Wilson for the black and white photos.